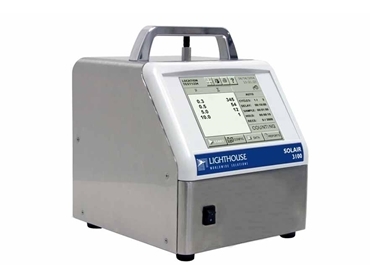 Particle & Surface Sciences introduces the Lighthouse SOLAIR 3100 portable airborne particle counters, the latest addition to the SOLAIR particle counter family. Featuring an updated design, the new SOLAIR 3100 airborne particle counters now include sampling and reporting recipes as well as the internationalisation of European and Asian languages. The new particle counters employ the latest in optical particle counting technology. SOLAIR 3100 airborne particle counters are available in a fanless design that does not compromise the cleanliness of cleanrooms while a removable Li-Ion battery provides over four hours of continuous operation. The SOLAIR 3100 offers a sensitivity of 0.3 micron with a flow rate of 1.0 CFM and wide dynamic range up to 25.0 microns.